A decade ago, in April 2007, Delta Air Lines remerged from bankruptcy protection following an arduous 18-month ordeal. The carrier had been mismanaged for years. Crippled by inefficient aircraft, high labour costs, and rising pensions, the Atlanta-based airline was finally pushed over the cliff by a sharp increase in the price of fuel. But the episode marked the beginning of a phoenix-like rebirth, with Delta’s share price more than doubling over the last ten years to stand above $50 today. The merger with Northwest Airlines in 2008 created the largest commercial airline in the world, with more than 700 aircraft under its wing. Now, at the end of 2017, Delta is looking optimistically ahead, its troubles far behind it. But chief executive Ed Bastion cites the bankruptcy as the inspiration for everything that has followed. Addressing an industry audience, he explains: “We adopted our motto - ‘Keep Climbing’ - in 2007 as we came out of the bankruptcy and lifted ourselves back into the market place. “I love talking to our people about this image, of climbing; you are in the mountains and the further you go up the more than you can see. “What opportunities there are and what things there are to fix. Bastian talks with a visionary zeal about Delta, charting a course for the carrier far into the future. He adds: “This year we will invest $4 billion in capital into our business, in our product, and I envisage this rate will be maintained for a number of years. So how does this focus on renewal, growth, and investment translate for passengers? On the ground it means a focus on technology, with Delta rolling out a number of innovations designed to save its passenger time, that most valuable of resources. The latest version of the Delta app, for example, automatically checks passengers into their flight the day before departure, making travel just that little more seamless. 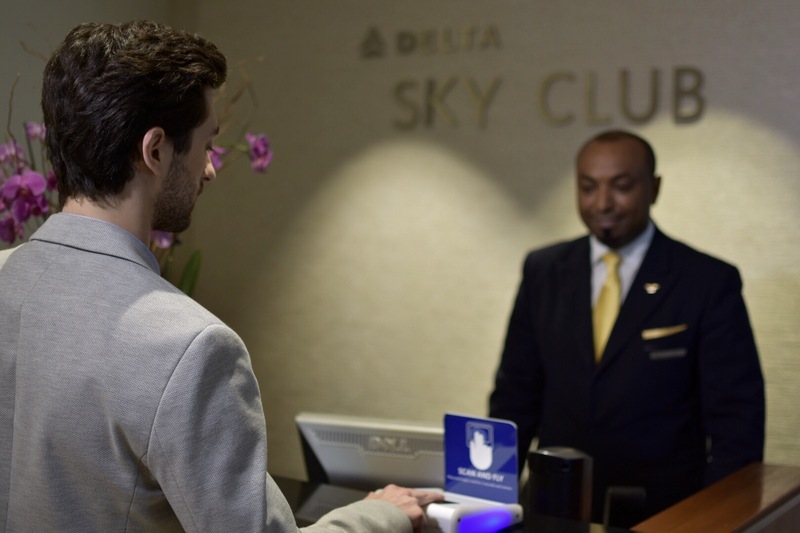 At the airport, Delta launched a biometric experiment at Washington National earlier this year alongside partners Clear. Here new technology allows passengers to use their fingerprint as identification, checking-in, depositing bags, entering the lounge, and boarding a flight, all without a paper boarding pass. Again the system is designed to remove the barriers to travel. At Minneapolis-St. Paul International Airport, Delta has introduced a self-service bag drop, using facial-recognition technology so passengers can simply do it themselves. The carrier is also introducing radio frequency identification tags, offering customers live push notifications from critical points along their bag’s journey. A quick note will let a customer know when their bag is successfully loaded onto an aircraft as well as which carousel it will arrive at for pickup. As Gareth Joyce, senior vice president, airport customer service at Delta Air Lines, explains: “Delta will not stop innovating at every opportunity to bring a world-class experience to our customers. In a wider context, Delta hopes the introduction of these new technologies will free staff to interact more meaningfully with passengers. Far from being replaced by machines, staff will have more time to assist travellers who need further help, the airline says. With these incremental improvements, Delta is seeking to develop a reputation for efficient, technologically driven service. But it is on-board the plane that really counts and it is in this area Delta is making its largest bet - on the Airbus A350. Seen as the flag-ship of the airline, Delta has received the first two planes, with a further 23 on order. The first A350 is scheduled to enter service later this month, between Detroit and Tokyo-Narita, with departures to Seoul, Beijing and Shanghai starting on November 18th, January 17th and April 19th respectively. On board, the plane is fitted with 32 Delta One suites. 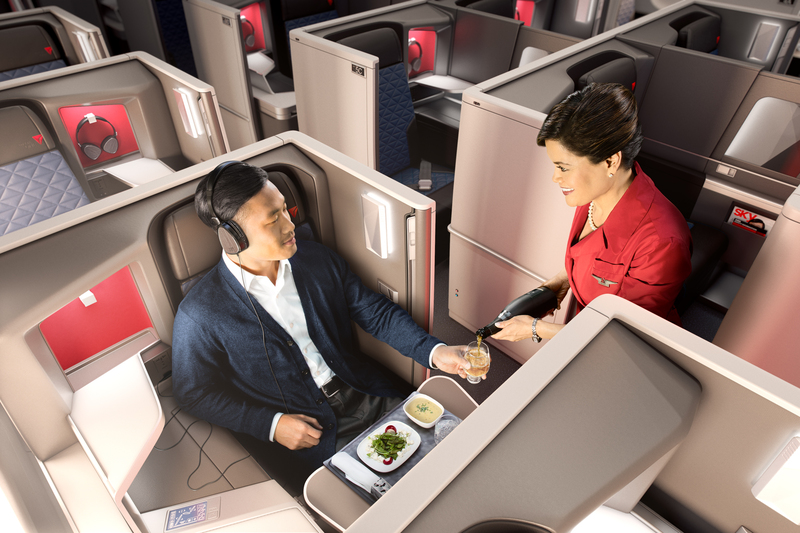 Each offers a dedicated in-cabin flight attendant, a lie-flat bed with direct aisle access, an enticing new menu, a wide selection of beverages, and everything else you would expect from a leading carrier in 2017. Guests can also pre-select their in-flight meal for the first time. The hope is to wow business travellers on the profitable trans-Atlantic and trans-Pacific routes. Bastian continues: “We have focused our investment in our product, particularly the business product. But alongside comfort, speed is here too of the essence. Gil West, chief operating officer, Delta Air Lines, adds the Airbus A350 is the “perfect fit aircraft” for Delta’s the long-haul network. Pointing out is it 20 per cent more fuel efficient than the planes it replaces, he also observers it can fly at mach 0.89 – faster than any other commercial plane currently in the skies. This cuts journey times – again saving the passenger that vital resource, time. 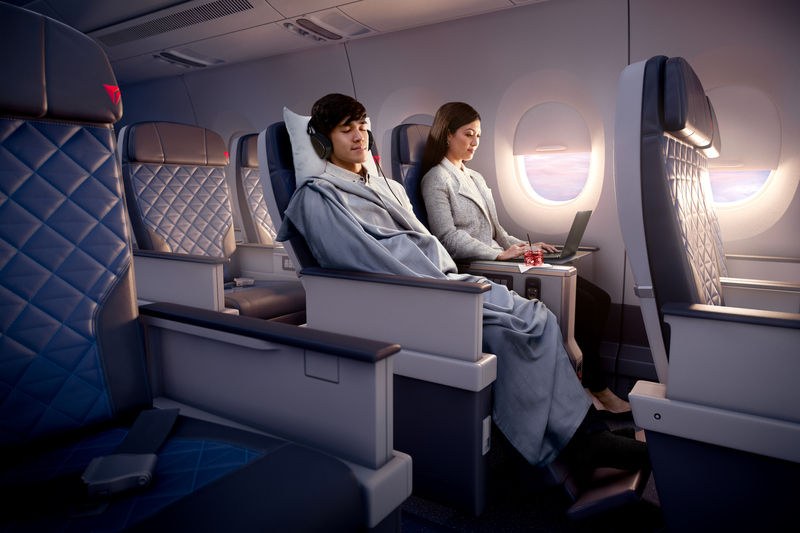 The Airbus A350 will also see Delta introduce the Premier Select service, offering holidaymakers with a little cash to spare or budget-conscience business travellers a new level of service. Available on select international routes, the new cabin offers more space to stretch out and relax, with a wider seat, additional recline, and an adjustable footrest. With plated meals and a dedicated flight attendant, travellers can also cruise in complete comfort. Even those in economy class are set to benefit, with Delta recently introducing Prosseco to all cabins. The Airbus A350, then, fits into a wider transformation of Delta Air Lines. The carrier is seeking to reimagine the travel experience, using new tools, staff, and technology to incrementally improve the journey for a passenger – a world away from the troubles of just a few short years ago. With an industry-leading global network, Delta and the Delta Connection carriers offer service to 315 destinations in 54 countries on six continents. Headquartered in Atlanta, Delta employs more than 80,000 employees worldwide and operates a mainline fleet of more than 800 aircraft.